While FDM printing has been very advantageous to designers prototyping products it isn’t always up to the task of creating really refined products for sale. Though it is exciting to see all the new filament options available now, there’s something to be said about SLS printed products. They are generally stronger and have a more polished appearance than is possible through FDM desktop printing. 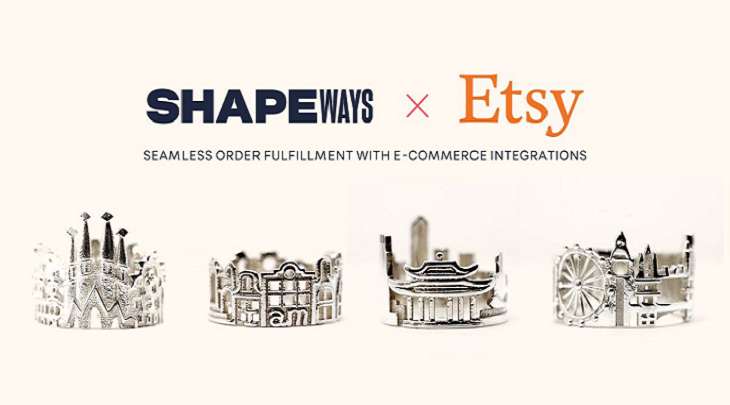 Printing services like Shapeways have capitalized on this fact and have created an easy way for designers to get professional looking products to their customers. And their material selection continues to grow. Today Shapeways has introduced a new addition to their materials lineup, aluminum. Aluminum is their 54th material offering and was introduced last year as part of their pilot program. With the help of community members Shapeways was able to perfect the material and now it is available to all designers. So what’s so special about aluminum? Shapeways 3D printed aluminum has a higher strength to weight ratio than any of their other materials. It is highly corrosion resistant, has high thermal conductivity and the ability to support interlocking parts. Due to its material properties, notably its high strength to weight ratio, 3D printed aluminum is widely used in the aerospace and automotive industries. Designers using Shapeways aluminum material will find it ideal for applications that require products to remain light while still being able to carry a strong load. Designers will find Shapeways 3D printed aluminum ideal for various gadgets, such as gears and toys, drone parts and tools, such as bottle openers, multitools and camera rigs. Shapeways notes that aluminum is also widely used for protective casing for laptops, phones and sports equipment. Designers looking to print in aluminum are advised to check out the aluminum material page to hear Shapeways Material Product Manager Blair explain how their aluminum material can be best used. If you have a design that you want to test out printing in aluminum, you can upload it and place an order and within a couple weeks you’ll have your first 3D printed aluminum design! Even those with no 3D modeling experience can get in on aluminum printing. You can connect with a designer who can bring your idea to life. Questions regarding 3D printing in Shapeways aluminum can be directed to their Community Manager, Andrew, at andrew@shapeways.com or you can post to the forums and Andrew will guide you from there. Aluminum is certainly an exciting material and I’m sure it will be very popular with designers of all stripes. I’m curious to see what new products are made with this material. I’m already thinking of incorporating it in my designs. Hmmm, I wonder if anyone would be interested in a 3D printed aluminum handbag?